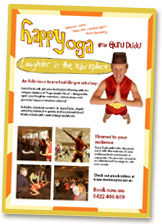 Guru Dudu from 'Happy Yoga' leads the way with these hilarious workshops that can be tailored to include 'in-jokes' from your workplace. 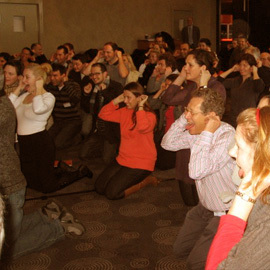 The audience is led into simple stretches that involve a ‘twist’ or two that help the laughter meridians to flow! N.B. 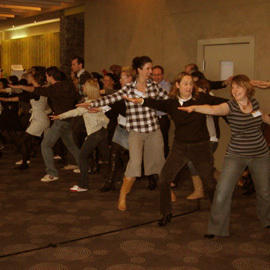 This is a unique workshop distinct from the "Laughter Yoga" movement. David is always sensing the audience and has a wonderful gift of being able to improvise in the moment to ensure the audience is always coming with him. 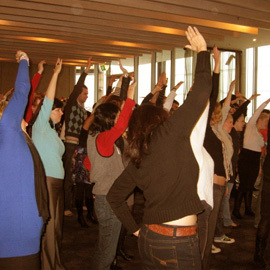 LAUGHTER IN THE WORKPLACE workshops can be tailored to include references relating to your industry/sector. Workshop duration is 20-60 mins to suit your needs. 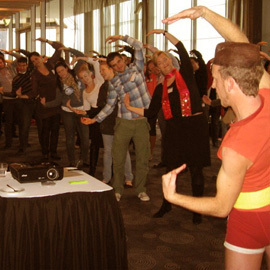 "I've enjoyed working with David, he is an insightful facilitator who is able to quickly engage and energise a group with irreverent humour and play. 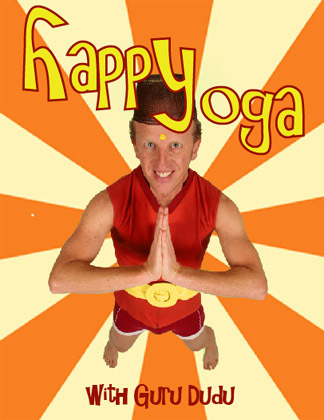 His Happy Yoga sessions add a valuable dimension to our leadership programs and integrate leadership concepts in unexpected ways." Happy Yoga opened up our group allowing them to free themselves, have fun and joke around - a nice contrast to being too rigid and business like. - Igor Posenjak, Melbourne Water. Want to bring some laughter to your workplace or community?